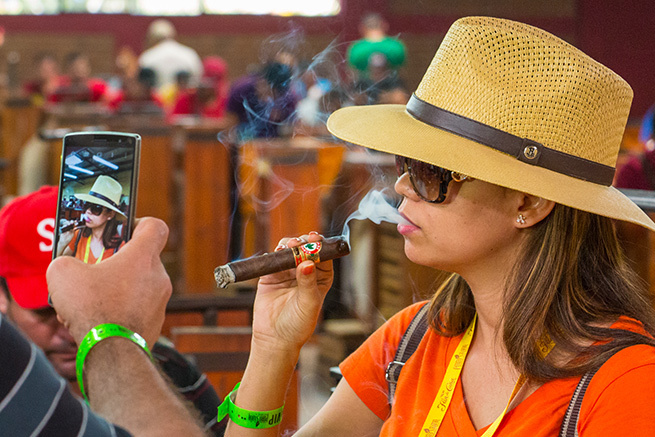 Once again and for the fifth time, cigar enthusiasts, industry experts, suppliers, aficionados, cigar retailers, cigar distributors, cigar magazines and cigar bloggers from all over the world joined in the largest and most important cigar event in Nicaragua. Puro Sabor is a four-day extravaganza in which participants enjoyed an array of exciting activities that range from cigar tastings to factory visits and even gala events. The festival is organized by the Nicaraguan Chamber of Tobacco, formed by the 24 leading companies in tobacco production and cigar manufacturing in the country. The festival took place from January 12 to January 16 in different cities of Nicaragua. There were around 197 attendees that came from all over the world and represented 27 countries including Argentina, Australia, Brazil, Israel and many more. However, the most remarkable number of the festival can’t be accounted for, since all participants got unlimited cigars for the duration of the festival. I bet you are probably already wishing you made the trip down here, keep reading to find out exclusive details about what else goes on at the festival. What Goes Down at the Festival? After being greeted at Managua Airport’s VIP lounge, attendees are then taken to the hotel to relax and get ready for the activities to come. The first official day begins by taking the tour of the renowned Nicaraguan rum, Flor de Caña. Following the visit to the Flor de Caña tour, attendees visited a farm where they were offered an excellent environment to pair cigars with an 18 year Centenario rum while also watching a breathtaking equestrian show. To top it off, participants get to enjoy the cigar tasting event of the festival “Puro Humo”. There, they can get to know most Nicaraguan cigar brands and enjoy a smoke with fellow enthusiasts. This event not only hosts international attendees, but it is also open to the Nicaraguan public adding around 500 attendees to the list. In the next couple of days, participants traveled to Esteli, ‘Tobacco’s Capital City” to enjoy a tour of the most famous tobacco factories and plantations where some of the best cigars are created. Some of these brands include AJ Fernandez, Drew Estate Tobacco Company S.A, Joya de Nicaragua, My Father, Nicaraguan American Cigars S.A, Oliva Cigars, Padrón, Pensa, Plasencia, Procenicsa, and Scandinavian Tobacco Group. To end the day in style, participants attended the ‘White Party’ a tradition of this cigar event. There, they were able to listen to traditional tunes and even wear the traditional Nicaraguan ensemble of ‘Guayabera’ made in Nicaragua. Lastly, participants spent their last day touring the majestic tobacco plantations of the region and visiting the factories. Through this experience, they learned about the production and manufacturing of cigars. After their tour a lunch hosted at the curing barn was served, enhancing, even more, the experience. To finalize the festival, the major Nicaraguan legends of tobacco held a conference about the tobacco industry where participants were able to ask questions. To finish with a cherry on top everyone got to dance the night away at the closing gala where participants, as well as many personalities in the industry, were present. Indeed, all of Puro Sabor participants took home with them the aroma and rich history of Nicaraguan Tobacco. But, most importantly, they had a fantastic time doing it. Join us next year for Puro Sabor 2017 that will take place in Nicaragua the third week of January 2017, more details to come later!